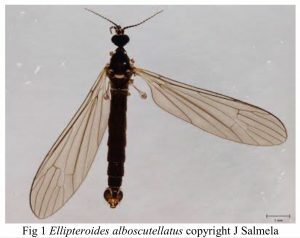 From April through October 2018, 150 species of insect were identified from sampling in Dallington Forest; 48 of the Coleoptera species, 37 of the Diptera and 2 Hemiptera were saproxylic – dependent on decaying wood, giving a total of 87 saproxylic species; 16 of the species trapped are of special note due to their rarity across Britain, and these comprise 5 Nationally Rare and 11 Nationally Scarce species. The report by Ecological Consultant Dr. Keith Alexander was commissioned by Dallington Forest Project. It was funded by a grant from Sussex Lund, grant application assisted by the Woodland Trust, Ancients of the Future (a Buglife project funded by the heritage Lottery Fund) provided traps and materials, and Peter Chandler identified the Diptera. Saproxylic invertebrates are those invertebrates that are dependent on dead or decaying wood (or dependent on other organisms that are themselves dependent on dead wood). These invertebrates may not be dependent on the wood for their entire life cycle but at least some stage is dependent on wood. A good example of this are the larvae of some beetles that feed on decaying wood. The adults may feed on other things (such as nectar). Dead wood is an essential component of woodland ecosystems, but one that is often overlooked and cleared away as unsightly or on the grounds of safety or neatness. As a result, invertebrate species that rely on dead wood are now some of the most threatened in Britain. It is vital to retain a variety of dead wood habitats within the woodland. This includes standing trees, dead branches, stems and snags on living trees and fallen branches and stumps. A range of dead wood at all stages of decay will provide a range of habitats for more specialist saproxylic (dead wood) invertebrates.